The demand for looped carpet was not very high until the popularity of berber carpet dramatically increased. Performance provided by looped carpet was traditionally known as the best, but it had limited appeal to homeowners due to their low profile and cushioning. Due to newer constructions with the use of larger loops, this style of carpet can offer higher performances, lower densities, and other services typically expected of it. Level Loop – This types can be usually found in commercial environments. There are also some residential berbers that have been offered in this style. Loops that are constructed for this carpet type are at the same height. Even with patterns printed on it, a smooth feel is still offered. With a lower density construction, there may be an allowance of the loops to be dispersed farther apart. Textured Loop – This product offers a slightly different type of loop. This creates an interesting style and pattern. The fiber color can vary and this can complement the visibility of the pattern. This type of carpet also has a relatively easy carpet installation process. Multilevel Loop – This type is quite similar to the textured loop style. The difference is the height variations are more dramatic. This provides a deep and easily visible pattern with or without the enhancement of color. 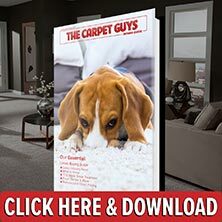 If you are in the process of looking for new carpeting and looped carpet has caught your interest, it is important to find the correct installer to properly place the carpet in your home. The Carpet Guys are the people for the job. With us providing some of the best looped carpet products and proper carpet installation, you cannot go wrong. Take the time to fill out a free in-home estimate to get started on adding looped carpeting to your home today. If you are not interested in the looped carpet, feel free to take a look at the different types of carpet we have to offer. Whatever the carpet needs may be, we are confident that we have the product you are looking for. We appreciate your consideration of getting service from The Carpet Guys, LLC.